News Releases - Kaufman Sales Co. 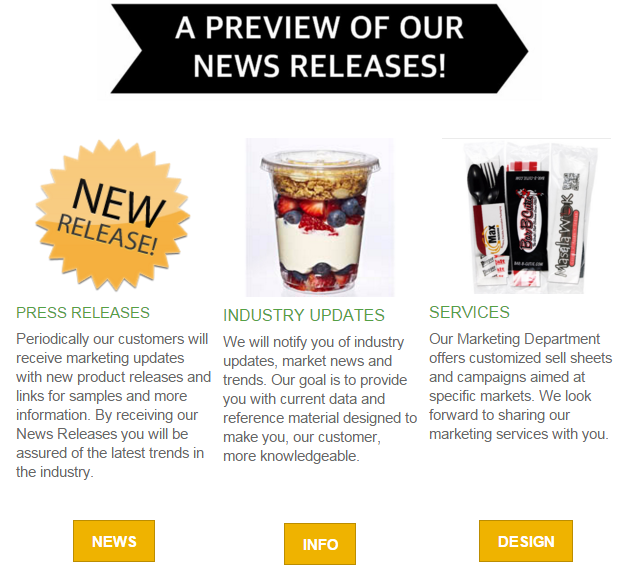 Periodically our customers will receive marketing updates with new product releases and links for samples and more information. By receiving our News Releases you will be assured of the latest trends in the industry. In case you missed our latest News Release you can find it here or contact us to be added to our email list! Riding this year in the 2016 PAN-MASS CHALLENGE is our very own Dan Butts. This is a grueling two day, 190 mile bike-a-thon that crosses the Commonwealth of Massachusetts and raises money for life-saving cancer research and treatment at Dana-Farber Cancer Institute. PMC has donated 100% of every rider-raised dollar directly to cancer research and treatment at Dana-Farber Cancer Institute. We wish Dan a safe and healthy ride and hope you will help us in supporting the fight against cancer. AEP Industries Award. Congratulations to all. being featured in theNew England Based GRIFFIN REPORT.